15 Early Stage Researchers (ESRs) will be employed to undertake research in the framework of the project “VRACE: Virtual Reality Audio for Cyber Environments”, and will be funded for 36 months through the prestigious Marie Skłodowska-Curie Actions (MSCA) Innovative Training Network (ITN) programme. 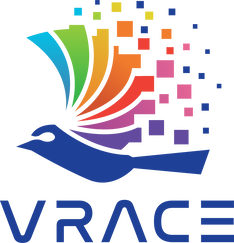 VRACE will establish a multidisciplinary training and research programme focusing on the analysis, modelling and rendering of dynamic 3-dimensional soundscapes for applications in Virtual Reality (VR) and Augmented Reality (AR), delivered by nine cooperating European Universities and their industrial partners, including Siemens, Mueller BBM, Sennheiser and Facebook Reality Labs (former Oculus). In addition to their individual scientific projects, all ESRs will benefit from further continuing education through a dedicated training program in the various fields of expertise of the consortium partners, which includes active participation in workshops, conferences and outreach activities. Objectives: Reconstruction of near field sound of multiple sources from wave field analysis and additional cues obtained from sensors and prior knowledge (e.g. 3D environment model). Study of laser-based techniques for sound source localisation and remote vibration sensing. Objectives: Investigate methods to quantify experimentally the directional radiativity properties of a range of musical instruments, paying particular attention to the relevance of such measurements for real-world situations and applications. Use of microphone-array and motion capture techniques to collect sound radiation data for different playing styles and dynamic ranges. Use of these experimental data to validate and inform related physics-based and fully-embedded acoustic simulations in the time domain. Extract directivity functions from experimental data and numerical simulations which allow deriving a realistic near field sound based on dry music recorded in an anechoic chamber. Objectives: Studying the nonlinear dynamics of collisions between elastic solids with the aim of modelling sound excitation mechanisms in musical instruments (such as the vibrating lips of brass players, the reeds of wind instruments or hammer-string / mallet-membrane interactions). The developed non-smooth numerical methods will be extended to a variety of sound-generating objects that may be encountered in VR / AR. Objectives: Investigation of the interaction of small ensembles such as quartets with variable room acoustic conditions. Investigation of the effect of variable reverberance and reflections on the performance of ensembles. Studying how individual and joint performance strategies of musicians are affected by different acoustic environments. Wave field analysis and synthesis of orchestra and ensemble sounds with sensory evaluation of quality parameters of analysis and reproduction. Objectives: Experimental determination of the JND in the perception of asynchrony between auditory and visual components of a media event and its modalities. Determination of the relationship between perceived asynchrony and VR immersiveness. Objectives: Adapting existing physics-based emission models for moving sources (vehicles or wind turbine blades) and for background noise (wind-induced noise and vegetation noise) in a sound synthesis context. Accounting for the effects of atmospheric variations, ground and obstacles in the propagation model of the sound synthesis tool. Objectives: Development of a single sound propagation model that is valid in the full audible range, based on a combination of element-based approaches and geometrical methods, using parallel filter banks for different frequency bands, taking GPU acceleration in consideration. Objectives: Efficient numerical calculation of HRTFs for individual VR experiences based on mesh generation techniques for head/torso/pinna such as photogrammetry and model-order reduction techniques. Investigating suitability of different methods for hardware acceleration on GPUs. Objectives: Experimental determination of the JND (just noticeable differences) of certain parameters of spatial soundscapes and thresholds beyond which degradation of sound source localisation, disorientation and possible motion sickness starts to occur. Objectives: Efficient, adaptive, realistic and good sounding binaural synthesis for VR/AR, Acquisition, comprehension and compensation of headphone influences. The IKT will contribute with its competence in the field of signal processing for virtual acoustics and the assessment of subjective aspects of human hearing in listening experiments. There will be a strong collaboration with the ESR at SENN especially in the area of headphone related acoustics. Objectives: Introducing extended parameter time-variance in physics-based simulations of musical instruments and other mechano-acoustic sources. Studying stability and energy conserving properties of numerical algorithms with respect to dynamic parameter variations. Sound synthesis under time-variation of parameters as articulated by musicians and other users. Objectives: To study, compare and further develop advanced acoustic modelling and auralisation methods for interior spaces. Assessment of the subjective relevance of predicted or measured quality parameters for concert theatres, multipurpose halls and other communication spaces. Use of sensory focussed approaches to identify the auditory relevance of architectural features. Objectives: Studying Discontinuous Galerkin Methods to find the most efficient ways of implementing them on massively parallel hardware. Studying CUDA, OpenCL, and OpenAAC as a base for personal high performance parallel computing. Developing applications in structural acoustics, room acoustics and environmental acoustics. Comparing computing times for different software and hardware platforms and architectures. Objectives: Numerical simulations of the sound generation in the speaker and the sound transmission from speaker to ear drum. Optimization of the acoustical transparency of the headphone by means of active feed through. Active compensation of occlusion effects. Adaptive compensation of wearer or device related parameter variations. Incorporating human perception models for the optimization of headphone characteristics. Validation of the results by sensory evaluations.